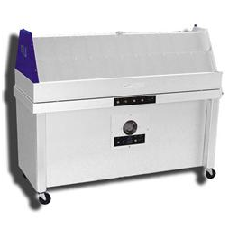 The QUV accelerated weathering tester reproduces the damage caused by sunlight, rain and dew. In a few days or weeks, the QUV tester can reproduce the damage that occurs over months or years outdoors. To simulate outdoor weathering, the QUV tester exposes materials to alternating cycles of UV light and moisture at controlled, elevated temperatures. It simulates the effects of sunlight using special fluorescent UV lamps. It simulates dew and rain with condensing humidity and/or water spray. The QUV accelerated weathering tester is the simplest, most reliable, and easiest to use weathering tester available. With thousands of testers in use worldwide, it is the world's most widely used weathering tester. UV light is responsible for almost all photodegradation of durable materials exposed outdoors. The QUV tester’s fluorescent lamps simulate the critical short-wave UV and realistically reproduce the physical property damage caused by sunlight. Types of damage include color change, gloss loss, chalking, cracking, crazing, hazing, blistering, embrittlement, strength loss and oxidation. Dew, not rain, is responsible for most of the wetness that occurs in outdoor exposure. The QUV tester's condensation system realistically simulates dew and accelerates its effect using elevated temperature. The condensation process automatically purifies the ordinary tap water used in the system. This is because the process of evaporating and condensing the water onto the specimens is actually a distillation process, which removes all impurities. The QUV tester conveniently accommodate up to 48 specimens (75mm x 150mm) and complies with a wide range of international, national, and industry specifications, ensuring the reliability and reproducibility of your test program. Visit our standards page for more information. QUV/cw: cool white visible light, condensation and SOLAR EYE irradiance control. The Q-SUN Xe-1 xenon arc chamber reproduces the damage caused by full-spectrum sunlight and rain. In a few days or weeks, the Q-SUN tester can reproduce the damage that occurs over months or years outdoors. 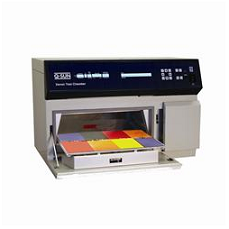 The Q-SUN Xe-1 tester is a tabletop lightfastness, colorfastness, and photostability chamber. It has a single xenon arc lamp and is available with optional water spray and chiller. Its small scale is perfect for a lab with a limited budget or only an occasional need for testing. Installation of the Xe-1 tester is simple and specimens can be conveniently mounted horizontally on its flat specimen tray. The Q-SUN Xe-1 tester is the simplest, most reliable, and easiest to use xenon arc test chamber available. The Q-SUN Xe-1 tester’s xenon arc lamps provide the best match to the full spectrum of sunlight. Near-horizontal specimen mounting and optional water spray provide the most realistic moisture simulation available in a compact xenon arc tester. 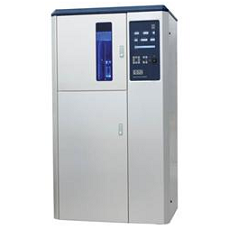 An optional chiller is available for low temperature applications. A product exposed outdoors to direct sunlight experiences maximum light intensity for only a few hours each day. The Q-SUN Xe-1 tester can subject test specimens to the equivalent of noon summer sunlight for 24 hours a day, every day. Consequently, specimen degradation can be highly accelerated. The Q-SUN Xe-1 tester’s low purchase price, low lamp prices and low operating costs create a breakthrough in the price/performance equation. Now even the smallest lab can afford xenon arc testing. The Q-SUN Xe-3 xenon arc chamber reproduces the damage caused by full-spectrum sunlight and rain. In a few days or weeks, the Q-SUN tester can reproduce the damage that occurs over months or years outdoors. The Q-SUN Xe-3 tester is a full-featured lightfastness, colorfastness, and photostability chamber at a breakthrough price. It utilizes three separate xenon lamps for a large capacity. The Q-SUN Xe-3 tester’s slide out specimen tray is 451mm x 718mm and is useful for exposing large, three-dimensional parts or components. The Xe-3 tester offers standard humidity control, and optional spray, back spray and chiller features. 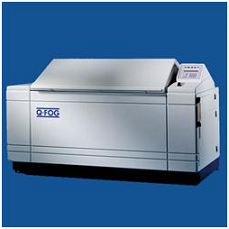 The Q-SUN Xe-3 is the only xenon arc tester that also has an optional dual spray capability. This allows for a second liquid such as acid rain or soap solutions, to be sprayed onto test specimens. The Q-SUN Xe-3 is the simplest, most reliable, and easiest to use full-sized xenon arc chamber available. The Q-SUN Xe-3 tester’s xenon arc lamps provide the best match to the full spectrum of sunlight. Near-horizontal specimen mounting and optional water and back spray provide the most realistic moisture simulation available in a xenon arc tester. The Xe-3 tester also is the only xenon test chamber to offer a dual spray option, allowing a second liquid (such as acid rain) to be sprayed onto test specimens. An optional chiller for low temperature applications also allows for simultaneous control of both black panel and chamber air temperature. A product exposed outdoors to direct sunlight experiences maximum light intensity for only a few hours each day. The Q-SUN Xe-3 chamber can subject test specimens to the equivalent of noon summer sunlight for 24 hours a day, every day. Consequently, specimen degradation can be highly accelerated. The Q-SUN Xe-3 tester’s low purchase price, low lamp prices and low operating costs create a breakthrough in the price/performance equation. Now even the smallest lab can afford xenon arc testing. Q-SUN Xe-3-HSC: full-spectrum sunlight with humidity control, spray and chiller. The Q-SUN B02 rotating rack xenon arc chamber reproduces the damage caused by full-spectrum sunlight and rain. It was designed specifically to meet the ISO 105 B02 standard for textile lightfastness testing. In a few days or weeks, the Q-SUN B02 tester can reproduce the damage that occurs over months or years outdoors. The B02 tester is affordable, full-featured, and has a large specimen capacity. It provides precise control of critical test parameters including spectrum, irradiance, relative humidity, chamber temperature and black standard temperature. Water spray is also an available option. The Q-SUN B02 tester is the simplest, most reliable, and easiest to use rotating rack xenon arc tester available. The revolving drum Q-SUN Model B02 tester was designed specifically to meet the ISO 105 B02 standard for textile lightfastness testing. It uses the latest technology to provide precise control of critical test parameters including spectrum, irradiance, relative humidity, chamber temperature and black standard temperature. The Q-SUN B02 tester sets the standard with higher specimen capacity than most competitive testers – 31 AATCC prepared samples in 16 holders. Q-SUN B02 specimen holders are very easy to install and remove. ISO and AATCC textile masks are also available. The Q-SUN B02 tester’s xenon arc lamps provide the best match to the full spectrum of sunlight, which is critical for lightfastness testing of most textiles. Vertical specimen mounting, standard RH and optional water spray provide realistic moisture simulation. The unit is capable of simultaneous control of both black panel and chamber air temperature. A product exposed outdoors to direct sunlight experiences maximum light intensity for only a few hours each day. The Q-SUN B02 tester can accelerate results by subjecting test specimens to the equivalent of noon summer sunlight for 24 hours a day, every day. Consequently, specimen degradation can be highly accelerated. The Q-SUN B02 tester was specifically designed to be an affordable lightfastness tester that meets the requirements of ISO and AATCC. The Q-SUN B02 tester’s low purchase price, low lamp prices, and low operating costs set a new standard for lightfastness testing. Now even the smallest lab can afford rotating rack xenon lightfastness testing. Cyclic corrosion testing provides the best possible laboratory simulation of natural atmospheric corrosion. Research indicates that test results are similar to outdoors in resulting structure, morphology, and relative corrosion rates. Q-FOG cyclic corrosion chambers from Q-Lab can run traditional salt spray, Prohesion, and most cyclic automotive tests. Q-FOG chambers are available in two sizes to fulfill a wide range of testing requirements. Q-FOG cyclic corrosion testers are the simplest, most reliable, and easiest to use corrosion testers available. Prior to cyclic corrosion testing, conventional salt spray (a continuous salt spray at 35˚C), was the standard way to simulate corrosion in a lab. Because conventional salt spray methods failed to mimic the natural wet/dry cycles of the outdoors, test results frequently provided poor correlation to outdoors. In a Q-FOG cyclic corrosion tester, specimens are exposed to a series of different environments in a repetitive cycle that mimics the outdoors. Simple cycles, such as Prohesion, may consist of cycling between salt fog and dry conditions. More sophisticated automotive methods may call for multi-step cycles that incorporate humidity or condensation, along with salt spray and dry-off. Within one Q-FOG chamber, it is possible to cycle through a series of the most significant corrosion environments. Even extremely complex test cycles can easily be programmed with the Q-FOG controller. See LF8110 - Q-FOG Specifications or visit our standards page for a detailed list of test methods met by the Q-FOG chamber. Q-FOG corrosion test chambers are available in two types. Model SSP performs traditional salt spray and Prohesion tests. Model CCT performs salt spray, Prohesion, and 100% humidity for most cyclic automotive tests. The Q-FOG test chamber is designed to cycle between four conditions: Fog, Dry-Off, 100% Humidity (Model CCT only), and Dwell. Test conditions, time, and temperature are controlled by a built-in microprocessor. A remarkably simple user interface allows for easy user programming and operation. The operator can quickly create new cycles, or run any of the programmed cycles. The Q-FOG controller includes complete self-diagnostics, including warning messages, routine service reminders and safety shut down. The Q-FOG tester has a low belt line and an easy opening lid for easy sample mounting. The SSP-600 and CCT-600 models have a capacity of about 160 test panels of 75mm x 150mm in size. 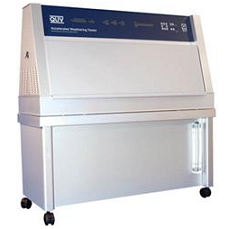 The SSP-1100 and CCT-1100 models have a capacity of 240 test panels. The Q-FOG cyclic corrosion chamber has superior fog dispersion compared to conventional systems, which cannot vary volume and distance independently. A variable speed peristaltic pump controls the amount of corrosive solution delivered to the spray atomizer, while the air pressure regulator controls the distance of the “throw.” Note that purified water is required for proper operation of Q-FOG corrosion testers. Space utilization is maximized and maintenance is minimized with the Q-FOG tester's internal solution reservoir. The 120 liter reservoir has enough capacity for running most tests for 7 days or more. The reservoir has an integral salt filter and a built-in alarm to alert the operator when the solution is low. Q-FOG testers can change temperatures exceptionally fast because of their unique internal chamber heater and their high volume cooling/dry-off blower. An additional air heater allows very low humidity dry-off exposures. Conventional chambers with water jackets cannot cycle rapidly because of the thermal mass of the water, nor can they produce low humidity. Q-FOG cyclic corrosion testers offer state of the art corrosion testing technology, reliability, ease of operation and easy maintenance – all at a remarkably affordable price. BS 3900, Part F9, Determination of Resistance to Humidity (Continuous Condensation). For over 50 years, Q-PANEL test substrates have been recognized as the world standard for a consistent and uniform test surface for paints, plating, adhesives, sealants, rust inhibitors and other coatings. Thousands of labs around the world use millions of our steel and aluminum panels every year for color development, weathering exposures, salt spray and corrosion testing, physical properties testing and quality control. 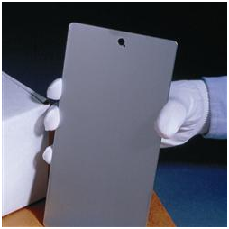 A wide range of panel sizes and types are available for immediate shipment from stock. 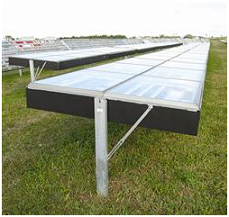 Q-RACK outdoor exposure racks are the same aluminum racks that are used at Q-Lab Florida and Q-Lab Arizona to perform natural outdoor exposure tests. Now you can buy these professional quality racks to perform exposures at your own site. Q-RACK outdoor exposure rack kits are available in two types: direct exposure and under glass exposure. 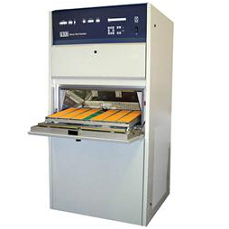 See LR-3001 - Q-RACK Brochure for photos and more detailed information. In direct exposure racks, specimens are directly exposed to the environment. It is the most common method for testing coatings, inks, plastics, or finishes used outdoors. Most typical test specimens can be easily mounted on a Q-RACK direct exposure system. Our direct exposure rack kits meet the requirements of ISO 877-2 Method A, ASTM G7, ASTM D4141, or SAE J1976. Be sure to visit our Standards Page for other information about relevant standards for Q-RACK systems or our other products and services.